Forget Wi-Fi, forget Bluetooth, forget NFC and even wireless charging–that rat’s nest of wires behind your computer desk is going nowhere fast. No matter what a recent Apple patent portends. 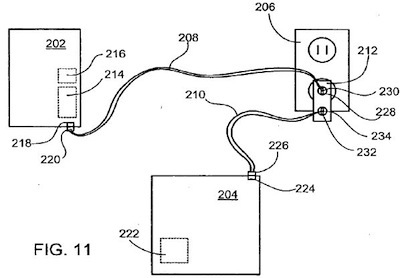 Apple recently filed a patent, as the hardware giant often loves to do for defensive or real-tech purposes, that tries to simplify some of the wires threading to and from your iPod, iPhone, Mac and wall-wart charger. It’s clever, and it will add to other efforts like Thunderbolt to simplify–and empower–the wires that connect our gear together. But this is also proof positive that despite a plethora of radio-based wireless innovations, the humble (irritating, coiling, roller-chair-snagging, cat-tempting) copper wires we all love and hate are here for ages to come. Apple’s patent starts with a simple idea: When your iPhone and Mac are on a desk, odds are one or both will be plugged into a wall charger, and you may well have your iPod cable hanging from your Mac’s USB socket too–so why not just marry up these cables, and reduce the number of wires as well as items plugged in? The innovation: the same cable charging your Mac will also share data down to the wall wart, which has another socket on it for your iPhone. It’ll reduce your cable count slightly, as well as simplify the tangle on your desk and the number of wires you need to slot into your bag. But it’s still wired. Likewise Apple and Intel’s innovation with Thunderbolt. The plan is to dramatically change how you connect peripherals–adding fantastical data speeds and allowing simple connections like wiring your laptop to a monitor, then daisy-chaining another monitor off that, and then an external hard drive off this second screen. Thunderbolt may be a plan to take over every wire on your desk, and (when hardware manufacturers get up to speed and drop the price of the cabling) it’ll definitely simplify things. But it’s still wired. In the future Intel’s teased a super-high-speed variant which’ll transmit data at still faster rates over a fiber optic, and power over traditional copper wire. But it’s still also based on wiring–a long cable that thrums with data and power, but which still has to be plugged into something at both ends. Alongside these innovations is USB 3.0. If Thunderbolt only ever appeals to a minority (which would be a shame, because like the earlier, similar, but now mainly obsoleted FireWire tech, it’s superior to its peers) then there’s still USB 3.0 to think about. It too offers fantastic speeds, but not the smart daisy-chaining capabilities of Thunderbolt, meaning your cabling to your USB hub wired to printers, drives, and USB mug warmer will still be roughly the same. Wired. Tangly. Apple’s tried earlier innovations to get around some of the tangle, including its wildly successful MagSafe connector that just lightly yanks out of its socket, undamaged, if you happen to trip over the trailing cable that’s powering your Mac. 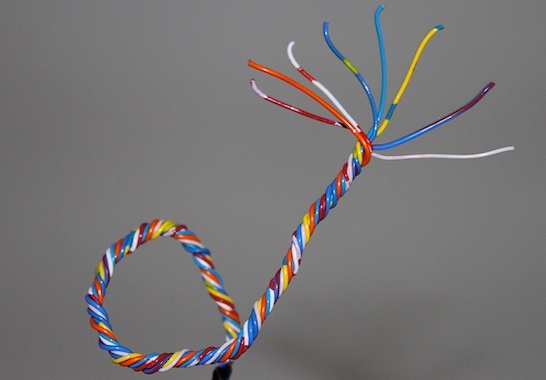 But while innovative, you can’t dodge the fact this is still a wire. And for the time being at least, Apple seems closely wedded to its iPod connector protocol–shunning initiatives to adopt a microUSB connector as a standard for phones and other portable gizmos–simply because it’s familiar, it just works, there’s a host of compatible peripherals out there, and the 30-pins of the format allow much deeper interaction between the inner hardware and whatever you plug into it. Wireless updates and syncs may well be coming to the iPhone in the next software update, but Apple will still need you to plug the thing in to charge it and connect to iTunes sometimes. Samsung was so impressed with the standard that when it cloned the iPad, it even managed to include a very similar connector into its Galaxy Tab slate PCs. This situation isn’t going to change anytime soon. You may dream of wireless power–which includes notions of charging your portable devices by remote from a significant distance–but it’s a way off. Recently Palm had a lovely notion for wirelessly charging its Pre smartphones, and HP developed the innovation further with wireless data sharing with the TouchPad…but with the demise of that platform, bang went consumer exposure to wire-free smartphones. The problems with wireless power are down to pure physics and engineering–working out how to losslessly share power across an air gap with simple, inexpensive components that don’t frazzle the user’s skin. And here’s why: Wires just work, they’re reliable and they’re cheap. Apple’s innovation often centers on paring down the components of a device to a form-marries-function pureness, but in a sense this agrees with its continuing use of wires. Simplify how such wiring happens, sure, but “if it ain’t broke, (and you don’t have something smart, reliable and elegant to replace it with) don’t fix it” may as well be Apple’s motto. Other suppliers of consumer electronics adhere much less strictly to this sort of design thinking, and they’ll just plump for “wires are cheap” and bundle in a bunch of them with every smartphone, computer, and dongle you buy for the next 10 years. There’s also a whole manufacturing engine pumping out cables of every sort, from USB to FireWire to Thunderbolt to proprietary device cables like Apple’s and Samsung’s. In 2008 alone, it was thought about two billion USB devices were sold–each of which needs a cable, and the figure is bound to have skyrocketed since then, possibly up to 10 billion, which is well over one device for every person alive on the planet, and that’s just USB. With the advent of USB 3 and Thunderbolt this installed base isn’t going to go away soon, nor are the factories and industries that drive it, and while next-gen products are arriving with wireless solutions, the technology is only now getting to the point it’s economical for companies like Canon to put wireless tech into devices like printers…thus shunning the need for a cable. Sad to say but in an era when we’re increasingly bathed in a miasma of radiowaves from our increasingly wireless devices, wires are here to stay.